You know those days where you spent so much time working on the main course, that you completely forgot to prepare a side dish? Well, that happens to me a LOT. More often than I’d like to admit. Sometimes I’m too busy, sometimes I too lazy, and sometimes I’m just ill-prepared. But on those days, quick and easy Weight Watchers salad recipes like this Cilantro Lime Cucumber Salad, save me. I almost always have these ingredients on hand, and I can throw this together in just a few minutes. I highly recommend using a mandolin slicer in order to get nice, evenly thin cucumber slices. But it can absolutely be done with a knife too – it’s just not as easy. The flavors are fresh and amazing, and each serving is just 2 Points. I usually prefer to go a bit heavy on the red pepper flakes as I really like that heat, but this time I made it for my kids, so I didn’t use as much. This salad also makes a perfect, low calorie side for summer BBQ’s, so definitely add it to your “must make this summer list”. Enjoy! Tangy, salty, crunchy, and with a kick of heat, this easy cucumber salad is a great low calorie side dish to throw together in a pinch. The flavors are simple, yet bold, and it pairs well with so many dishes. In a small bowl, whisk together the lime juice, olive oil, garlic, red pepper flakes and salt and pepper. 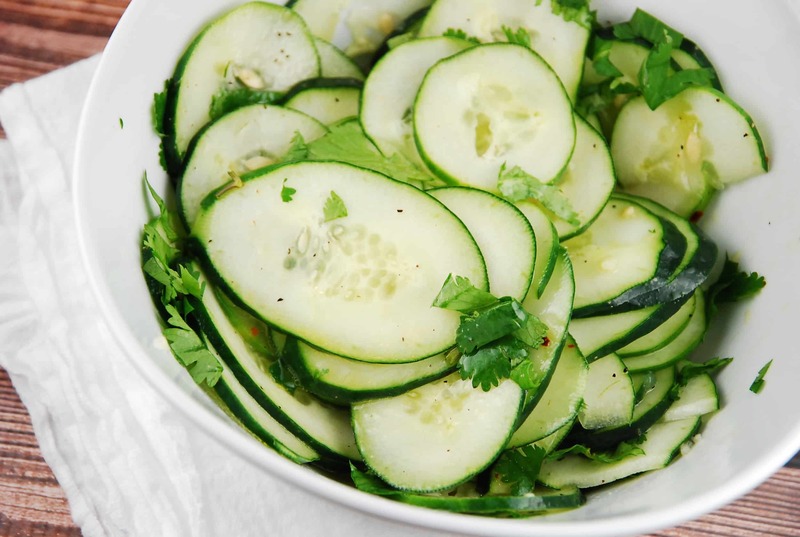 Toss cucumbers and cilantro together in a large bowl. Drizzle in dressing and toss to coat.